Has anyone else noticed that it’s been colder in April than it was in March? Granted I was traveling for half the month indulging myself in a strange mixture of sun, snow and plenty of temperature fluctuations, but the time I have spent in Chicago hasn’t exactly been the most pleasant. It’s rained. It’s been cloudy. It’s been cold. It’s been windy. The worst part is that May isn’t looking much better. Sorry but I’m not swayed by the promise of 80 degrees later this week considering it’s accompanied by t-storms and more wet weather. For me that means more complaining about the weather, running indoors when the weather sours (rain, rain, go away), leaving the bike hooked up to the trainer and dragging myself to the gym. Basically, it's lots of indoor workouts. Problem is that my usual gets stale really quick—and my routine indoor exercises overstayed their welcome during the winter (it always happens). So what’s a girl to do when she wants to ride her bike, but can’t, or won’t, go outside to do it? She heads to any indoor cycling class on the schedule--and Chicago's not shy on offering those with our own crop of Real Ryder Revolution, Flywheel and Spinning studios. Now usually that would involve a bit of a cash-flow problem for this Fit-Inker—I already belong to a gym and talked myself out of spending even more money in my already tight budget on fitness—but not this month. It’s National Bike Month and with it comes a ride that’s tough to refuse. Real Ryder Revolution is celebrating this biking holiday with a special unlimited pass for $150. And ride in the morning and get refueled with free bottles of Greater Than, a coconut water-based sports drink. Um, stop right there and sign me up. 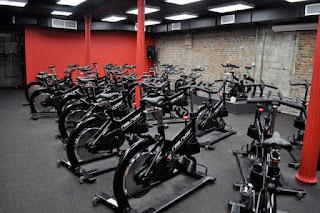 I already know how pricey fitness can get in the Windy City. The drop-in going rate is $20-$25—and that’s whether you’re cycling or doing yoga. So even if I only went once a day, which really is low-balling it for the endurance athlete in me (classes are 45 minutes and my Lakefront rides are at least 2 hours), I’d knock the price-per-class down to a more appetizing $5 per shot. But put the price aside, it’s more the workout that has me psyched about this offer. The Real Ryder bikes are unlike the Spinning bikes I’ve grown accustomed to and ride often. They’re the closest you can get to riding outdoors without having to weather the elements—as in, they’re not completely stationary. R3’s bikes rock, wobble and tilt in an attempt—and a pretty good one at that—to simulate outdoor riding. Plus they take it one step further with a big screen TV streaming a road ride to keep your eyes, and mind, off the workout’s pain. When you’re used to cycling still, it hurts (but what good workout doesn’t?) to turn, lean and get the core more involved during the 5-in-1 workout. And I’m not even accounting for the racing, crazy cadence counts that left my legs screaming (my instructor was a speed demon, I swear), and climbing that felt 10 times harder with the bike wobbling back and forth. Yeah, this cycling isn’t just about cardio and legs—it rips through your core, upper body and balance, and engages the mind-body connection. And if you’re focused on calories burned every time you work out, it promises an increased calorie burn, too, with most riders burning 700 to 1,000 calories per session. That’s one heck of a workout. No wonder I was so sweaty—and achy in my arms and sore down my sides—during my session at the Fab Fit Fest preview. But don’t consider that a complaint, it only fueled my fire to Real Ride again. Here’s the nitty-gritty on the deal: Real Ryder Revolution (R3) is located at 108 W. Hubbard in Chicago’s River North neighborhood. The package is $150.00 and allows unlimited rydes for 30 days after purchase. The package is a 12-month commitment for $150.00 per month and may be purchased online or at the studio. Patrons may cancel the membership, no penalty, with thirty days notice. Complimentary Greater Than sports drinks will be offered to the first class of the day, while supplies last. For more details and the class schedule, check out realryderrevolution.com.